It seemed paradoxical to the early white settlers of this country, as it still does for many of us today, that by applying a coating of grease mixed with a red clay pigment containing iron oxide (ochre) could be an effective means of maintaining healthy skin and bodily hygiene. 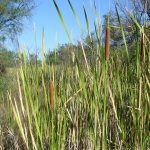 Traditionally the Noongar people of southwestern Australia inhabited an environment where fresh water was a scarce resource during a large portion of the year and in order to maintain bodily cleanliness they devised an effective substitute for water. 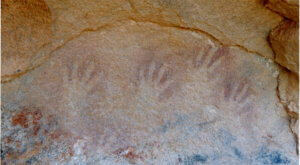 This was a topical unguent known as wilgi made from a mixture of ochre (iron oxide) and animal fat. Ochre is an earthy pigment containing ferric oxide, typically with clay, which varies in colour from dark red to brown to yellow. In Noongar culture wilgi (or wilgie, wilghee) as a bodily emollient was used for many different purposes including as a skin protectant shielding the body from the adverse effects of the sun’s ultraviolet rays. 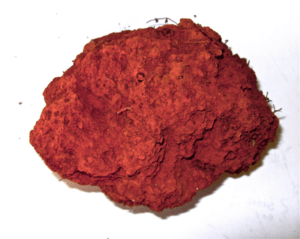 The photo-protective properties of red ochre have been confirmed by recent experiments conducted by an international team of scientists.2 The dense greasy covering of wilgi provided insulation during the cold, wet and windy seasons, while during the heat of summer it functioned as a humectant reducing moisture loss from the skin. 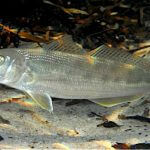 Wilgi may be likened to a protective layer of clothing. ‘The colour of the skin was a sort of iron-grey unlike natives I have seen. This was because he had not been allowed any grease to anoint himself with in accordance with the custom of both men and women.’ (Chauncy in Brough Smyth 1878: 276). A number of Aboriginal prisoners died at Rottnest as a result of heatstroke and exposure to the cold, having been prevented by prison authorities from using ochre and grease to protect themselves. ‘origin in the desire to protect the skin from the attacks of insects, and as a defence against the heat of the sun in summer, and the cold in the winter season. But no aboriginal Australian considers himself properly attired unless well clothed with grease and wilgi.’ (Moore 1842: 76). 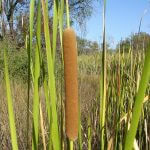 Moore, after his first ten years residing in the Swan River colony, became aware of the different uses of wilgi by Noongar people including as a protective barrier against the harsh climate and environment of southwestern Australia. It is well established in the scientific literature that mosquitos are attracted by odours emitted by humans such as carbon dioxide and perspiration. 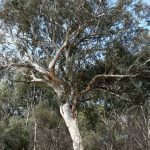 Noongar people found that wilgi provided them with a protective shield that concealed bodily odours. Smoke from campfires permeated the fatty covering of the wilgi smear, further masking the human scent. The ability of wilgi to mask the human scent was advantageous for hunters while stalking large game, such as kangaroo and emu. Red ochre was prepared by burning the hard clay and rocky material to obtain the iron oxide pigment which was then ground up into a fine powder that readily mixed with animal fat. A number of early recorders, such as Bunbury (1836), Grey (1840), Austin (1841) and Moore (1842), describe how it was used as an adornment. ‘or at other times reddish brown when saturated with wilghi. These are worn on the head or as armlets & occasionally when plentiful in the belt: well adorned with these & smeared with grease & red ochre a warrior is fully dressed….’ (Bunbury 1836 in Cameron and Barnes 2014: 168). ‘wil-gey – burnt ochreous clay with which the natives paint themselves (1840: 128). ‘wilgi – An ochrish clay, which when burned in the fire, turns to a bright brick-dust colour. With this, either in a dry powdery state, or saturated with grease, the aborigines, both men and women, are fond of rubbing themselves over. The females are contented with smearing their hands and faces, but the men apply it indiscriminately to all parts of the body. Occasionally they paint the legs and thighs with it in a dry state, either uniformly or in transverse bands and stripes, giving the appearance of red or parti-coloured pantaloons. This custom has had its origin in the desire to protect the skin from the attacks of insects, and as a defence against the heat of the sun in summer, and the cold in the winter season. But no aboriginal Australian considers himself properly attired unless well clothed with grease and wilgi.’ (Moore 1842: 76). ‘The grease‑paint, in addition to serving a decorative purpose, was useful in keeping away the ants, sandflies, and other insects. The renewal of the painting process depended greatly upon the supply of the ochre itself, and whether for the purpose of paying a visit to another camp, they were desirous of appearing at their best. It was not done every day, but if they were young men and fancied themselves, they would renew it as often as the inclination took them.’ (Austin 1841: 31-32). This reinforces the idea that Noongar people must have had a knowledge of the therapeutic use of iron supplements. 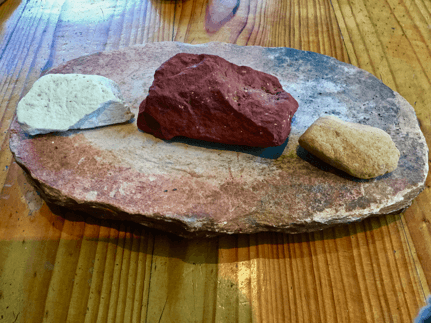 Wilgi – Red ochre ready for grinding into a fine powder. Photo by Barb Dobson. Wilgi – Red ochreous clay from Goonaring Springs, Toodyay. Photo by Ken Macintyre 2007. Studies conducted in Africa have demonstrated that ferruginous ochre pigment has antibacterial and antifungal properties making it effective in the management of infections associated with some pustular skin eruptions (Dauda et al. 2012: 5211). ‘They wore a cloak, bo‑ka, made of kangaroo hide (sometimes with a collar some 5 ins. or 6 ins. deep, which fell over) hanging to just below the knee, and shorter in front than behind. It was worn with the hairy side in, and was coloured on the outside with the wil‑gi.’ (Austin 1841 in Roth 1902: 32). Chauncy (in Brough Smyth 1878:237) also refers to Noongar people smothering the outside (non-fur side) of the boka as well as their faces and bodies with wilghee. We would suggest that not only was this a means of decoration but that the ochre and fat helped to preserve and waterproof the hide. 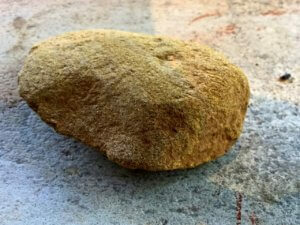 This practice of using ochre to tan animal hide probably dates back many thousands of years. A Noongar boomerang (kylie) preserved and decorated with wilgi mixed with grease. Photo by Ken Macintyre. Wilgie Mia (literally translates as “Ochre house”) located north-west of Cue, WA. Photo by Ken Macintyre. The earliest known paint used by humans was the natural red earth pigment ochre. 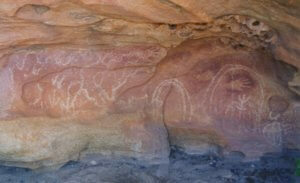 It was used extensively throughout Aboriginal Australia on rock art and artefacts. 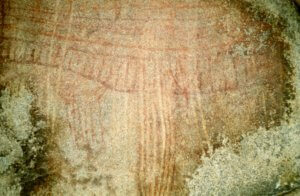 The pigment was mixed either with blood, fat or saliva (or water), depending on the particular art form. 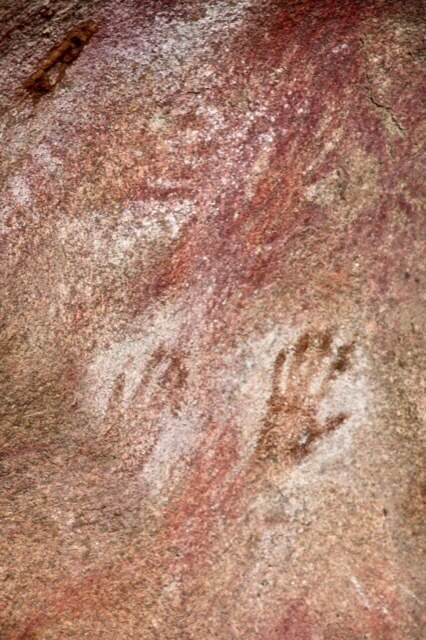 The hand stencil art form, which is one of the earliest forms of rock art in Australia, often symbolised ownership of country. 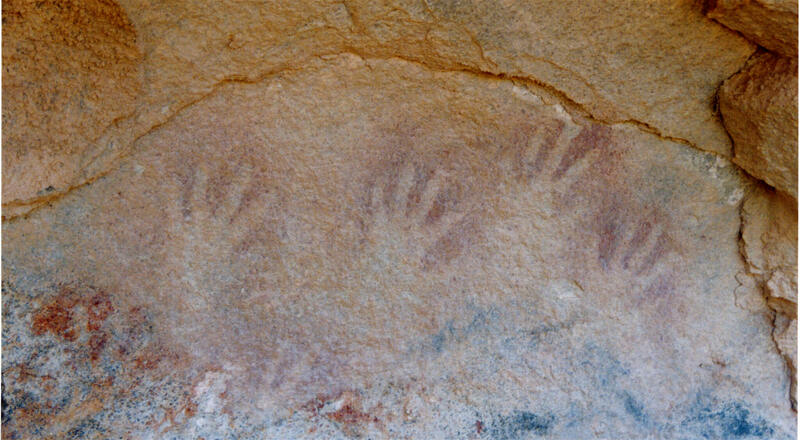 It was typically created by mixing ochre and water in the mouth and spraying it onto their splayed hand on the wall, leaving behind the outline of the hand. ‘a curious cave, called by the Aborigines Coujargnording, or the moon’s house. This cave is remarkable for having imprinted in the solid rock in which it is formed, a circular figure about 18 inches in diameter, and several mysterious prints of the human hand…’ (Perth Gazette 12th December 1840). This cave which is located in the side of a granite cliff south of York was first recorded by Dale (1830), hence it’s European name “Dale’s Cave.” It is also known as the Sun cave or Moon cave. 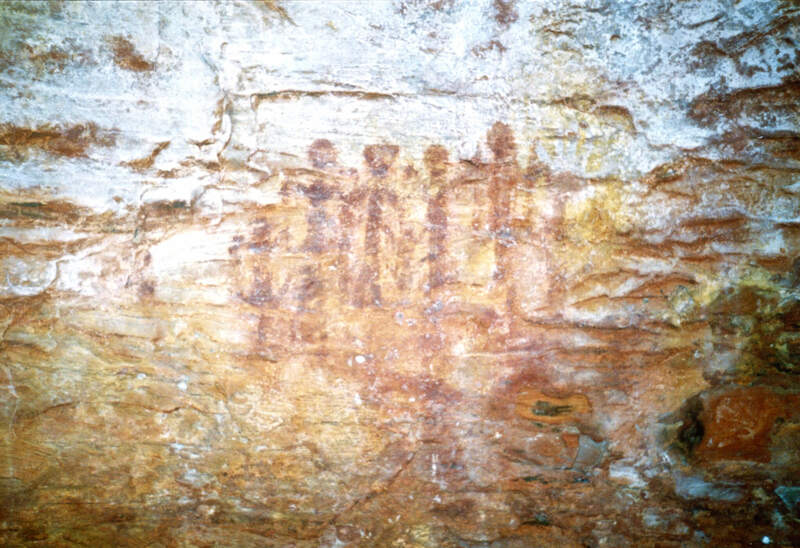 Some other ochre-decorated caves within Noongar territory include Frieze Cave (south of York), Mulka’s Cave (north of Hyden), and Marbaleerup (northeast of Esperance). 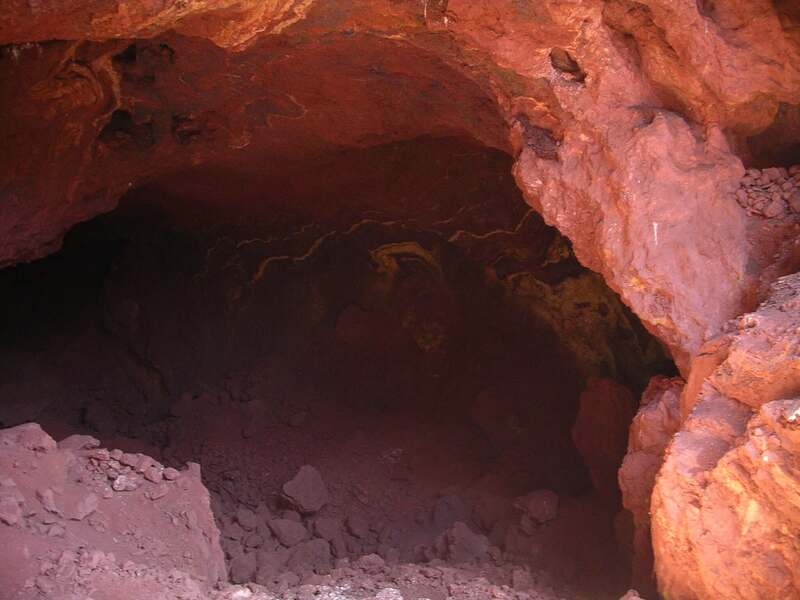 Mulka’s cave, north of Hyden. Photo by Barb Dobson 1993. Marbaleerup rockshelter, north east of Esperance. Photo by Ken Macintyre 1992. 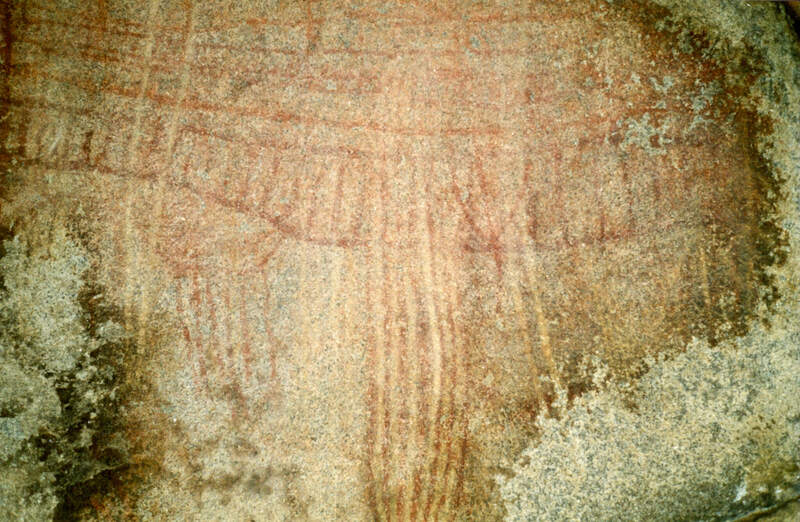 The hand stencils and motifs pictured below were observed by us on a granite rock shelter northeast of Cue, Western Australia. Rock art northeast of Cue. Photo by Ken Macintyre 1996. 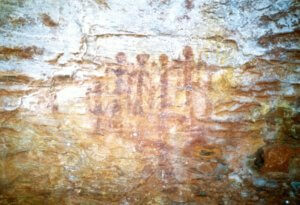 Other coloured ochres (and white clays) were also used for body decorations, ceremonial activities and rock art. 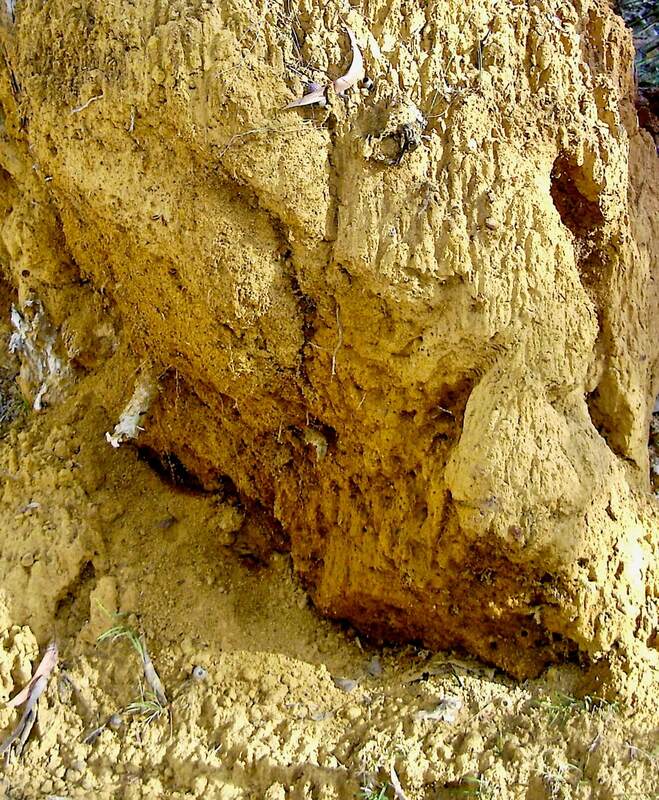 Even though these substances are chemically different and traditionally had different names, they are colloquially known as “ochre.” There are ochre deposits recorded at Red Hill in the City of Swan, northeast of Perth. 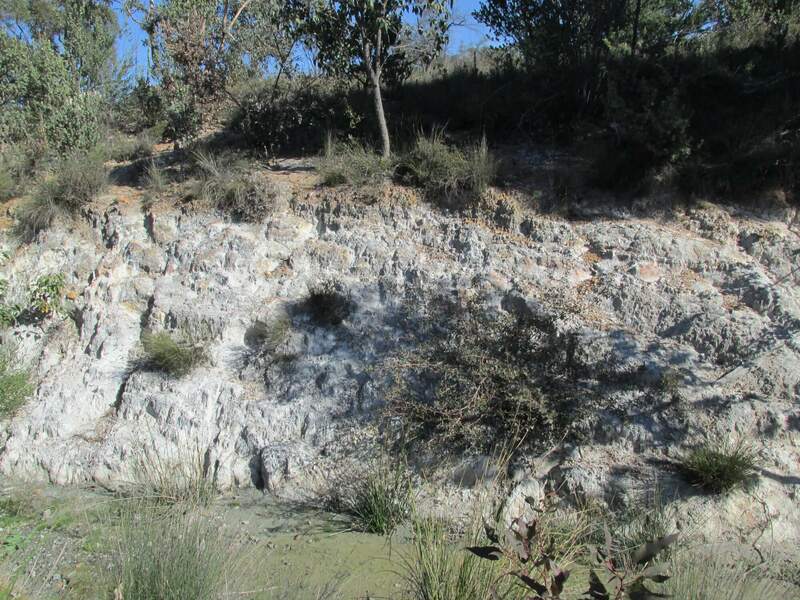 These ochre sites form part of a larger site complex in the Darling Scarp which includes the ancestral Owl stone, see https://anthropologyfromtheshed.com/project/report-owl-stone-aboriginal-site-red-hill-northeast-perth/According to anecdotal sources these red and white ochres may have been traded from this area. Archaeological evidence from Red Hill suggests that red ochre may have been processed and used on-site. 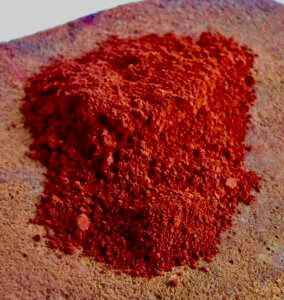 Red ochre powder. Photo by Ken Macintyre. White “creamy” ochre (sometimes referred to as “dardak”) deposit at Red Hill (DAA site ID 3433). Photo courtesy of the Swan River Nyungah native title People, 2015. 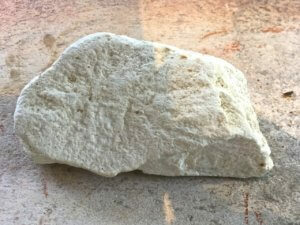 A hard white chalky clay (often referred to as white ochre). Photo by Ken Macintyre. Yellow ochre. Photo by Ken Macintyre. Yellow ochre, Goonaring Springs, Toodyay. Photo by Ken Macintyre 2007. 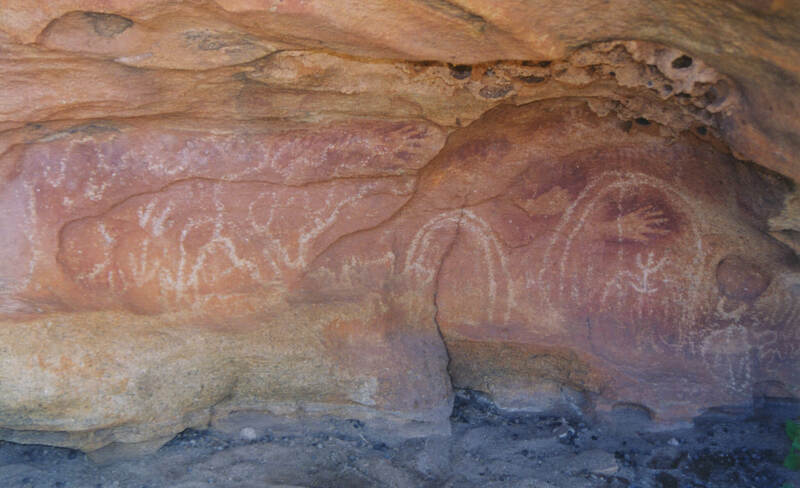 Red ochre was an essential ingredient of traditional Aboriginal culture that was highly valued for its fine smooth texture and deep red colouring. Its place of origin often connected the user to the final resting place of a significant totem or ancestral being, such as the kangaroo, dingo or emu. Red ochre often symbolises the metamorphised blood of an ancestral being whereas yellow ochre was said to signify the fat or bile. 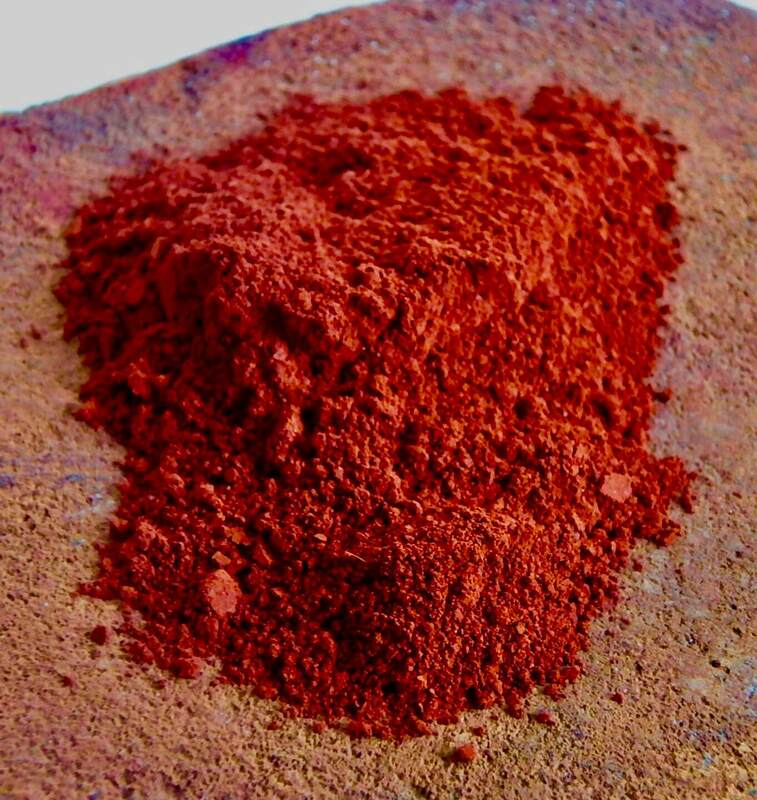 Ochre obtained from places of spiritual significance, such as Wilgie Mia (literally wilgi, red ochre + mia, house, home) located in the Wajarri Yamatji country of the Weld Range (Murchison, Western Australia) was regarded as the potent blood of the ancestral kangaroo. The quest to obtain this sacred element could be likened to a pilgrimage-like expedition to the resting place of a totemic ancestor. Trade for such a precious resource was often conducted through an intricate network of song lines over considerable distances. There is anecdotal evidence to suggest that Noongar people from as far away as King George Sound and Esperance travelled to Wilgie Mia to obtain this precious substance. According to Bates (1929) Fanny Balbuk inherited the ochre pit from her father and she was the last owner before it was covered by the foundations of the Perth railway station. ‘At burial, some offerings were left generally in the shape of damaged weapons, etc (but no food) on the grave itself, while upon the bark of neighbouring trees was smeared some red paint (wil‑gi), either in complete rings, or horizontally zigzag lines.’ (Roth 1902). 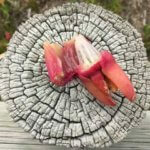 The extent to which wilgi was used in association with traditional Noongar funerary rites and ceremonies is unknown and to our knowledge has never been researched. 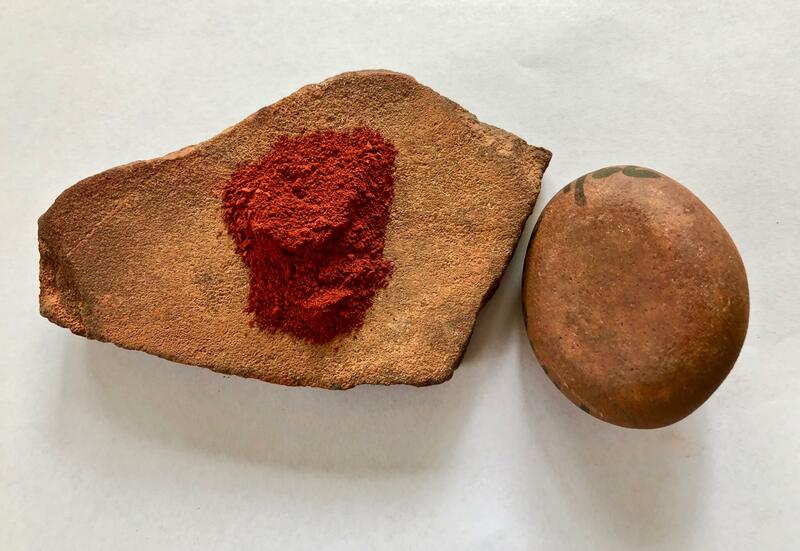 We would conclude that ochre was an essential ingredient of traditional indigenous culture providing a medium for bodily protection and decoration, art, ritual and medicine. Bates, D. 1929 ‘Aboriginal Perth.’ The Western Mail. July. Bates, D. (n.d.) Native trade routes. Commerce of Australian Aborigines (Battye Library Reference PR 2573/24). Bates, D. 1985. The Native Tribes of Western Australia. Isobel White (Ed.) Canberra: National Library of Australia. Bates, Daisy 1992 Aboriginal Perth: Bibbulmun Biographies and Legends. Peter J. Bridge (Ed.) Carlisle, Perth: Hesperian Press. Bindon, P. and Chadwick, R. (eds.) 1992 A Nyoongar Wordlist from the South-West of Western Australia. WA Museum, Anthropology Department. Brough Smyth, R. B. 1878 The Aborigines of Victoria. 2 vols. Melbourne and London. Browne, James 1836-1838 Aborigines of the King George Sound Region: the collected works of James Browne. Compiled and edited by anthropologists Ken Macintyre and Barbara Dobson. Victoria Park, Perth: Hesperian Press. Cameron, J.M.R. and P. Barnes (eds.) 2014 Lieutenant Bunbury’s Australian Sojourn: the letters and journals of Lieutenant H.W. Bunbury, 21st Royal North British Fusiliers, 1834-1837. Victoria Park, WA: Hesperian Press. Chauncy, Phillip 1878 ‘Notes and Anecdotes’ in R. Brough Smyth 1878 The Aborigines of Victoria. Vol 1. Melbourne and London. Dench, A. 1994 ‘Nyungar’ in Thieberger, N. and W. McGregor Macquarie Aboriginal Words. Macquarie University, N.S.W. Drummond, J. 1840 ‘Report on the botanical productions of the country from York district to King George’s Sound.’ The Perth Gazette and Western Australian Journal. September 24. Green, N. 1979 Nyungar – The People: Aboriginal customs in the southwest of Australia. Mt Lawley, North Perth: Creative Research Publishers. Grey, G. 1840 A Vocabulary of the Dialects of Southwestern Australia. 2nd edition. London: T & W Boone. 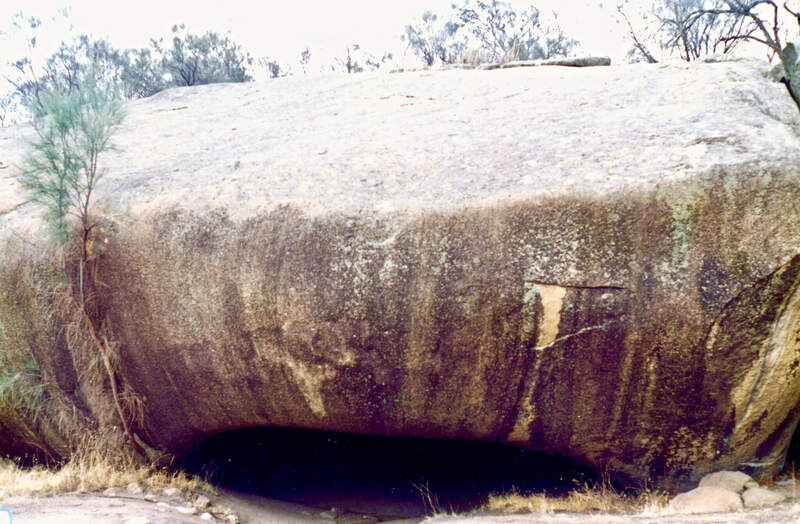 Gunn, R. G. 2006 ‘Mulka’s Cave Aboriginal rock a site: its context and content.’ Records of the Western Australian Museum 23: 19-41. Hallam. S. J. 1975 Fire and Hearth: a study of Aboriginal usage and European usurpation in south-western Australia. Canberra: Australian Institute of Aboriginal Studies. Hassell, Ethel 1975 My Dusky Friends: Aboriginal life, customs and legends and glimpses of station life at Jarramungup in the 1880’s. East Fremantle: C.W. Hassell. Moore, G.F. 1842 A Descriptive Vocabulary of the Language in Common Use Amongst the Aborigines of Western Australia. London: Orr. Mountford, C. P. 1976 The Nomads of the Australian Desert. Sydney: Rigby Limited. Nind, Scott 1831 Description of the Natives of King George’s Sound (Swan River Colony) and adjoining country. The Journal of the Royal Geographical Society of London, Vol 1, pp. 21-51. Written by Mr Scott Nind, and communicated by R.Brown Esq. Read 14th February. Paterson, N. and R.J. Lampert 1985 ‘A central Australian ochre mine.’ Records of the Australian Museum, 37 (1): 1-9. Sydney. Roth, W.E. 1902 ‘Notes of savage life in the early days of West Australian settlement.’ Based on reminiscences collected from F. Robert Austin, Civil Engineer, late Assistant Surveyor, W.A. (1841). Paper read before the Royal Society of Queensland 8th March 1902. Draft copy of paper provided to us by Peter Bridge from Hesperian Press. Salvado, R. 1851 in E.J. Storman 1977 The Salvado Memoirs. Nedlands: University of Western Australia Press. Shoobert (ed.) 2005 Western Australian Exploration 1826-1835, The Letters, Reports & Journals of Exploration and Discovery in Western Australia. Vol 1. Victoria Park: Hesperian Press. Stormon, E.J. 1977 The Salvado Memoirs. By Dom Rosendo Salvado, O.S.B. Translated and edited by E.J. Stormon. Nedlands: University of Western Australia Press. Thieberger, N. and W. McGregor 1994 Macquarie Aboriginal Words. Macquarie University, Sydney: The Macquarie Library Pty Ltd.
White, I. (Ed.) 1985 The Native Tribes of Western Australia. Canberra: National Library of Australia. Whitehurst, Rosemary 1992 Noongar Dictionary: Noongar to English and English to Noongar. Compiled by Rosemary Whitehurst. First Edition. Bunbury: Noongar Language and Culture Centre.